OK – yesterday I posted about gross profit, what it it means and how it compares between beers and pubs. 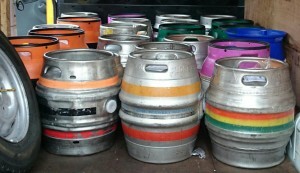 In the UK at the moment the full rate of duty is £18.37 per-hectolitre-%… (a hectolitre is 100 litres, or 176 pints) i.e. on a hectolitre of 5% beer you’d pay £91.85 in duty. But only if you’re a “big brewer” – one that brews 60,000 hectolitres or more. A “small brewer” who brews no more than 5000 hectolitres pays half the duty rate. And there is a “progressive” rate between these two sizes. This is due to the progressive-beer-duty scheme which is intended to give start-up breweries a boost to counter the economies-of-scale unlocked by being bigger. 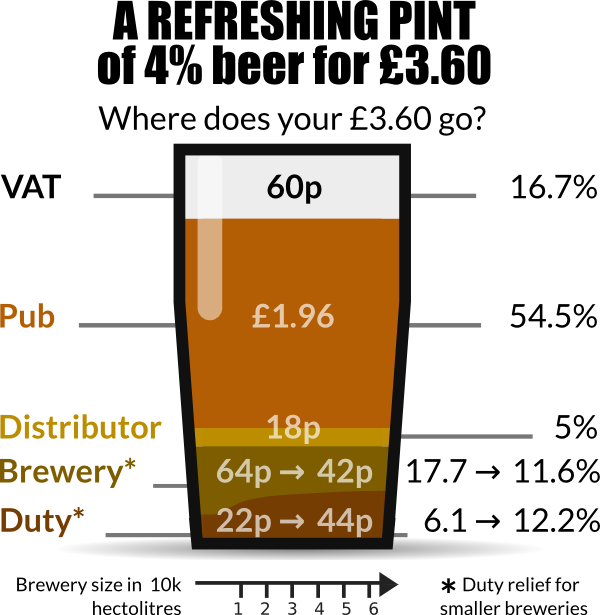 (There is debate over whether or not this discount is right, too much, or too little…) I’ve illustrated the progressive beer duty scale previously. At the end of the day duty is a part of the production cost of beer. Breweries pay it and factor it into their price. Then pubs calculate their GP on this price, typically as a %, then VAT is added also as a %. So duty gets amplified such that it can have a significant impact on final price. 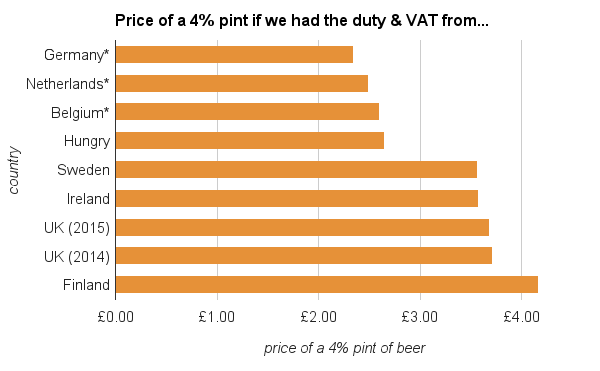 Regardless of the price of a firkin of beer (ignoring economies of scale) the difference between half duty rate and full after amplification by a typical 65% GP* and 20% VAT is always 74p on the cost of you pint. (The reality is that large breweries economies of scale allow them to sell firkins at the same price as small breweries so this difference hits the brewery books but not the consumer.) And between a zero duty rate and the current full duty rate the difference in price is amplified such that the difference to the consumer can be seen as a whopping £1.48… £1.96 at no-duty versus £3.43 at full-duty. I.e. £1.48 of your 4% ABV pint from a big brewery is added purely as a result of duty. So if duty was scrapped entirely we could probably enjoy more than a quid off the price of a pint. Wouldn’t that be nice! I expect I’d personally be in favour of scrapping or massively scaling-back beer duty and increasing VAT to 25%… but I’ve done no sums to support the total economic impact of such a change. This is just wild, and probably pointless, speculation at this point. It is worth noting that across the EU beer duty varies… the UK is one of the highest. So… there you go. Google tells me the average price of a pint in Germany is £2.12 so the above seems not too far off. Time to move to Germany! * typical 65% GP – I say this as my observation here in Cambridgeshire. Across the country this varies. Rents and wages are higher in Cambridge than, say, Hull – so where I pay £3.50 for a pint of a given type of beer I know some folk up north are paying £3.00 or even less. All the numbers above scale with the change in GP. If you want to play here’s the spreadsheet. Who gets how much of your beer £? 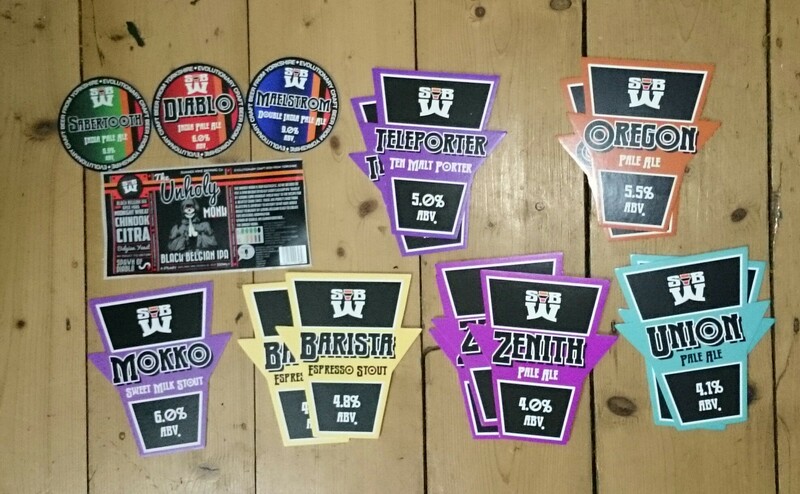 EDIT: 2014-05-03: I have adjusted the figures in this post to not use the minimum GP I’ve been applying to beers but something more normal/average – I’ve moved it from 11.11% to 17.24% but I’ve been told I ought to be targeting 20%. As I stated I’ve seen margins spanning from as low as £5 to £15 out there and I sort of went for the middle to start with (since I’m not in London). I’m a newbie at this… on a steep learning curve. I have clumsily tried to show the progressive beer duty here, in steps from the full relief rate through 10k, 20k, 30k, 40k, 50k hectolitre breweries to the full rate on the right. (In reality this is a gradual increase dependant on brewery production – not stepped.) 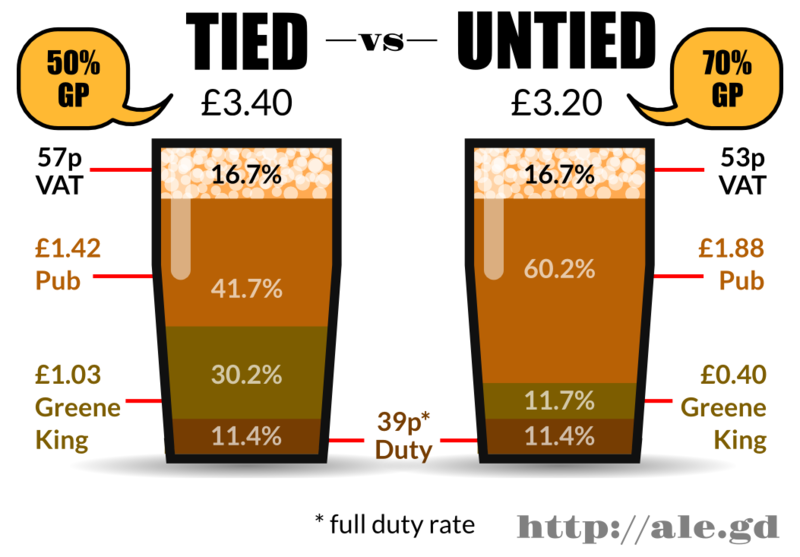 These figures are based on a 4% beer and as both the price of the pint and the duty will vary with the strength one could generate a variety of different versions of the above – however I believe the general gist of the ratios shown for my “£3.60 4% bitter in Cambridge” example will hold across a broad area and range of beers. The format of this is inspired by Yeastie Boys Stu’s lower-tech but far more characterful infographic shown here: What’s in my beer? Stu breaks it down further than I have, although remember he’s in New Zealand and his breakdown is focused more on the bottle market so is rather different to the UK situation. 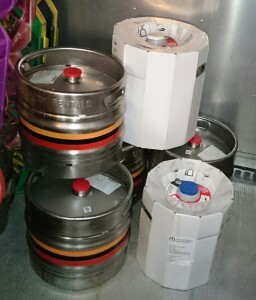 Freight costs in my case are part of the brewery’s costs in getting beer to me and part of my costs in returning empties to them, it can get more complex in the case of using eCasks too. Each of the “brewery”, “distributor”, and “pub” sections could be broken down further in similar ways. Everyone needs to rent/maintain facilities, pay for consumables, pay staff, etc. In fact Dave Bailey of Hardknott fame has contributed this level of detail from the brewer’s point of view to the Guardian: Beer: how much would you pay? I don’t think I’ve seen a breakdown for pubs but I expect high rents and high wage bills to consume a large chunk of their share. 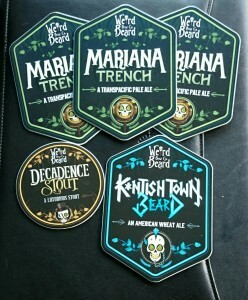 Don’t take this as a negative post, my customer base is building and I’ll continue to try and do what I desire to do… bring different and interesting beer into my area. I’m not trying to rip anyone off, I cannot “sharpen my pencil” as I’m only working with a stub of charcoal here. If you’re interested in beer and beer excites you then I think I have something to offer… in effect I work for you to get hold of the beers that the national beer scene is talking about, enjoying, and wanting to get their hands on. I have a fairly broad coverage from what’s hot in CAMRA/traditional circles to what’s turning heads amongst craft beer junkies. I feel I’ve come to know the UK beer scene pretty well at several levels and all I really want to do is spread the love. But… if beer is a replaceable commodity of no individual character or value to you then I’m afraid we aren’t going to get along. Finally – I’m a big believer in “openness”, I have hippy commie open-source roots, I’ve spoken of many variables in the text around the infographic… so, here’s my little spreadsheet: Who gets what from your beer money? You can duplicate this and play with the numbers as you like… or spot the errors in my calculations? (If so then please let me know!) Cheers to Geoff Latham of Pope’s Yard brewery for eye-balling my spreadsheet for me – however I do take full responsibility for any errors that snuck through of course!